It's that time, to teach classes at Emerge Pitt County Council of the Arts at the end of the month. I really do love teaching these small classes, I learn so much and so do my students. In the session I taught two years ago several of my students took it to the next level with their pieces. One of the best parts of taking a jewelry/metals class, as well as teaching, is that making objects trains your brain to think in new ways. You are actively challenging yourself to figure out how parts can go together and which way of connecting them makes the most sense. My friend Carrie sanding her piece. These are all made by Caroline Hedgepeth in my class from 2016. 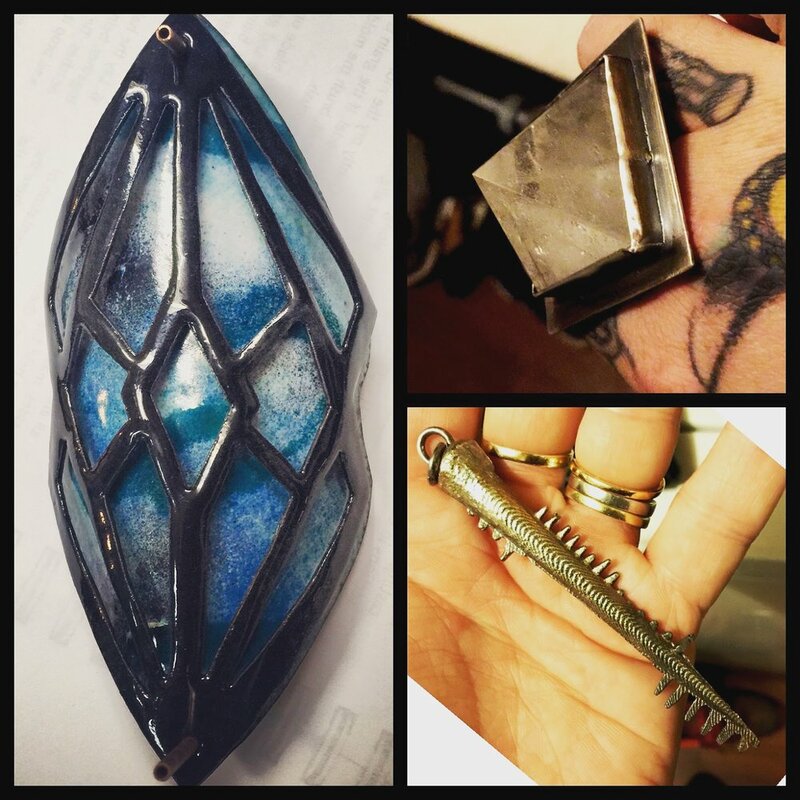 In the pieces Caroline made, especially the enameled pendant on the left, she made two pieces and tube riveted them together (or that is the plan). She wanted the texture of the piercing to overlay the splatter enamel she did. Even if you don't feel like you have a creative bone in your body (which in fact we all do) you will still love working with metal and making jewelry. It's so much fun! Sooooo, here's my pitch. If you live in the Greenville (Pitt county) area and want to learn jewelry making or take your jewelry to the next level - take my class! It's every Wednesday night, 6-8:30pm at Emerge Pitt County Council for the Arts. As always, thank you for reading and stay lovely! It feels very crucial this year, to celebrate such a day. Political upheaval is swirling around us - the world is changing and so is our involvement. Typically I don't get too political with my business and my blog but I do feel it is very pertinent to refer to several themes in my business - such as animals, wildlife, conservation and women - because it is part of the ethos of Eilisain. Yesterday I read a great article on one of my favorite websites, Refinery29, regarding the history of how International Women's Day got started. Back in the beginning of the 20th century much was changing in the world, as it is now, with a new labor movement growing in North America and much of Europe. And women from both sides of the globe convened in 1910 in Denmark for the second annual International Conference of Working Women. It was proposed at this meeting, by Clara Zetkin for countries to celebrate International Women's Day. The purpose being is to advocate and put pressure on our countries to expand women's rights. Thus finally in 1913 it was declared that March 8th be International Women's Day and has been celebrated ever since. In some countries it's a holiday! And today, the women that organzied the uber grand world wide Women's March also organized a Day without Women to signify how much of a force women are in the workplace and beyond. So how can you celebrate this day - even if you truly have to go to work- because many of us don't have the luxury or privilege of not working or fighting the system? 1. Wear RED - In solidarity with women striking work today. 2. Make your VOICE HEARD - Call your representatives, Congress people and local officials. Do you want equal pay for equal work? Better child care services and PAID MATERNITY AND PATERNITY? Do you want to better access to health services? Improved education? 3. SHOP and SUPPORT Women owned and small business' - ALL day erry-day. Let's say you're running around town and you need a quick coffee or sandwich, skip Starbucks or Arby's and hit up your local women-run business. You may spend a buck or two more BUT that money will go back into your community. 4. Use social media to spread the word - Not just today but as much as possible about women's history, women making a difference. It may not seem obvious on a daily basis but there is a true lack of knowledge and awareness about the HUGE part women play in our society.